The practice of telecommuting—that is, working from home instead of at a traditional office—has grown in recent decades. From 1980 to 2000, it was the only commute mode—save driving alone—to gain market share. All the other ways Americans get to work, such as carpooling and taking transit, became comparatively less popular. And consider that that growth occurred in the days before widespread high-speed Internet access and $4-per-gallon gas. Confronted with such new carrots and sticks we’d expect more American workers to embrace telecommuting. They seem to be doing just that. A July survey of three US metro areas revealed that telecommuting is the most popular substitute for driving alone. In another recent survey, 69 percent of business executives say its common for their employees to work off site, and 82 percent expect the trend to increase over the next five years. It’s more widespread than it used to be, and yet only four percent of Americans work from home. With steep gas prices and the growth of telecommuting friendly technology, why aren’t more of us working from our dens? There are plenty of reasons, including suspicious bosses, unfriendly public policy, and the fact that many jobs still cannot be done remotely. But I have a hunch that another reason also looms large: many folks dismiss telecommuting because they assume they have to give it their all. “I could never stay away from my office entirely,” they say. But who says they should? If someone were to ask about dining out we wouldn’t snap back, “I could never stay away from my kitchen entirely.” We should view telecommuting the same way we view dining out, as an activity with costs and benefits—something that should be done only when it makes sense. Ironically, more people will telecommute once they realize they don’t have to commit to telecommuting. Telecommuting isn’t an all-or-nothing choice; it’s a spectrum of choices. For most of us, our ideal spot on the spectrum lies somewhere between “always at the office” and “always at home.” Does that mean you should telecommute three days a week, once a week, once a month? The answer will be different for each person, and depends on countless factors, from the kind of work being done to the employee’s temperament (an introvert may look at a home office and see peace, an extrovert may see isolation). And what kind of atmosphere works best changes depending on the task. The person who generally enjoys the buzz of the office may still welcome the solitude of home when he’s under deadline to produce a written report. Sure, the prospect of telecommuting spurs anxieties. Bosses worry that spilling their office workers all across town will muck up communication, make it harder for newcomers to learn from veterans, and invite employees to slack off on company time. Employees worry about being out of the loop, spoiling the home sanctuary with work, and losing out on promotions to more visible colleagues. Some common anxieties have been quite thoroughly debunked—far from slacking off, telecommuters often prove more productive than their office bound counterparts. New technology can assuage some other anxieties. Software offers bosses every imaginable level of surveillance, including the most Orwellian of measures, such as tracking telecommuters’ every keystroke. But most anxieties stem not so much from telecommuting itself, but from the widespread assumption that choosing to telecommute means never setting foot in the office again. 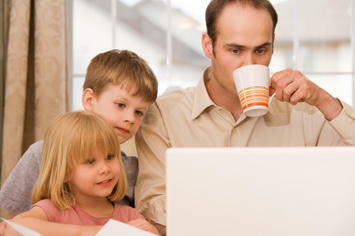 Part-time telecommuting eliminates the pressure of making a giant commitment. It allows for managers and employees to find their grooves, to sample some of the benefits of remote work without surrendering the office upside. Telecommuting isn’t just something you do; it’s something you learn. And it’s best to dip your toe before diving deeper. Starting small would benefit telecommuting skeptics as well true believers who plan on quitting the office cold turkey. Some full-time telecommuters grow frustrated with logistical or organizational snags and ditch their work-at-home dreams all together. Steering clear of the office, say, one day a week can help newbies ease through everything from their manager’s comfort level to whether they should switch to a laptop (or maybe try one of the services that allow folks to access their work computers from home). Once you get the hang of telecommuting once a week, try two or three times a week. If it gets to be too much, cut back. But—for the love of lower gas bills, a better environment, or whatever reason makes you take a stab at working at home—don’t give telecommuting your all. Ted Balaker produces documentary shorts for reason.tv and is a policy analyst at Reason Foundation. He is the author of the study, "The Quiet Success: Telecommuting’s Impact on Transportation and Beyond" and co-author (with Sam Staley) of the book, "The Road More Traveled" (Rowman & Littlefield, 2006). Submitted by davebarnes on Tue, 08/19/2008 - 11:26. Perfect advice for prospective telecommuters.